Christmas decorations can light up your home and give it a cozy feeling during the holiday season. There are many different options when it comes to Christmas decor, especially if you’re looking at outdoor decorations. But some of these lights and other items are difficult to install and can require the use of a ladder, tools, and other equipment. Plus, when the time comes to remove the lights after Christmas is over, you have to do the whole process again to take the lights down. One way to decorate your home that takes minimal effort but still offers beautiful results is by using laser Christmas lights. These lights are extremely easy to install and can be ready to use in minutes. Most simply require access to an electrical outlet. Many sets of laser Christmas lights include a stake for the ground as well as a stand that gives you different installation options. These lights come in various styles and colors so you can choose one that meets your decoration style. The following is a list of the 10 best laser Christmas lights based on consumer report. 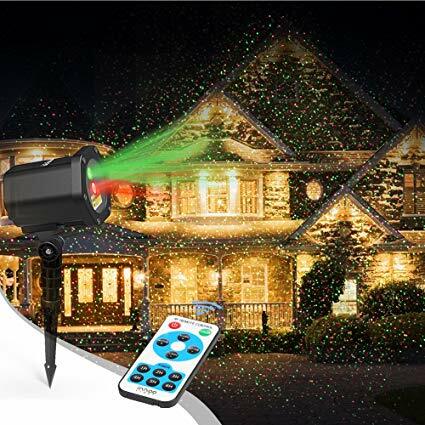 The Starry Laser Lights Landscape Projector is designed for indoor or outdoor usage. This projector is waterproof so you can use it in all types of weather without damage. It has 3 colors that can be adjusted to create different lighting effects. This projector from Starry is quick an easy to setup. 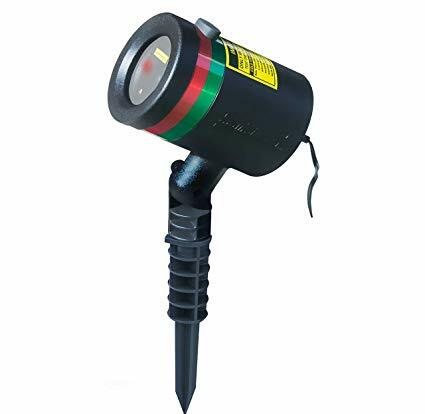 It comes with a stake for outdoor usage that allows you to have your lights setup in minutes. It also has an indoor base so that you can set the projector on a surface inside for a party or festive look for any occasion. 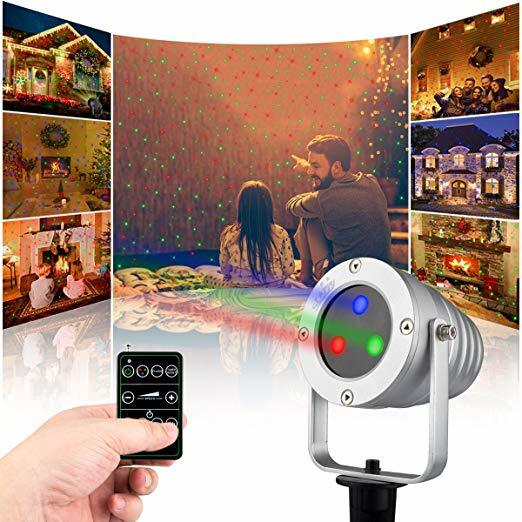 This indoor/outdoor projector shows red, green, and blue lights for a festive look around your home. They are easy to use and can be installed quickly. The projector comes with a remote control so you easily adjust the settings from inside your home. 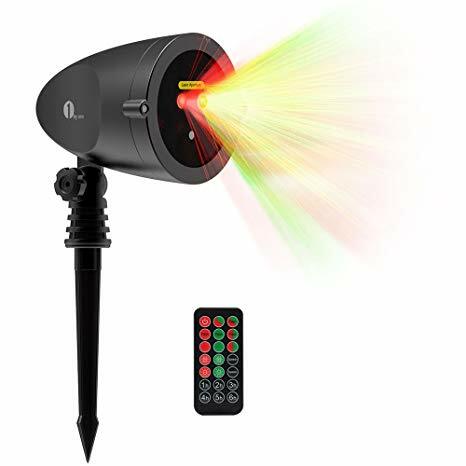 The Star Shower Static Laser Lights Star Projector is safe and easy to use. These lights require no ladders or complicated installation process. They have a wide coverage area which makes them ideal for larger homes where you only want to use one projector. 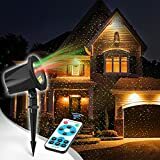 This laser lights projector from BulbHead has a weather resistant design so you can use them throughout the holiday season without concern for damage from snow or ice. The lights have both green and red colors and can be used separately or together. This laser projector uses much less energy that standard string lights and is also much easier to install. You can use the unit inside or outside with the included base and stake. 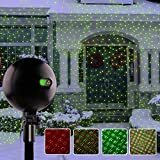 This laser projector is an affordable option that gives you a quick and easy way to decorate your home for the holidays. 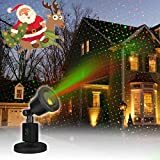 The CAMTOA Christmas Laser Light projector is an affordable option for anyone seeking an easy way to decorate the outside of their home. This projector has a waterproof design so you can use it outdoors in all types of weather. This projector from CAMTOA can also be used indoors for parties or celebrations. It has red and green lights that can be used on the outside of your home for a festive look throughout the holiday season. This projector shows more than 1000 tiny points. This laser light projector from CAMTOA is affordable and easy to use. It has red and green lights that create a beautiful Christmas display inside or outside your home. The projector displays over 1000 points of lights for a festive look during the Christmas season. These laser Christmas lights from Innoo Tech are versatile and can be used for many types of celebrations at your home. The lights include both red and green colors that can be used together or separately. This means you can use the unit for holidays other than Christmas. This laser projector is affordable and user friendly. It includes a convenient remote control that has buttons to adjust the color, the flashing effect, and the speed. The remote also gives you the option to set a timer for anywhere between 1 to 6 hours so the lights go of automatically. This laser projector is ideal for use during the Christmas season. It also gives you color and flashing options that can be ideal for other types of holidays or parties. The light projector is easy to install and the included remote lets you turn the unit on or off without going outside. 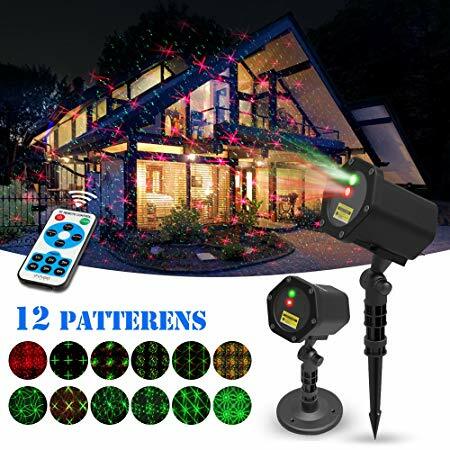 The Laser Christmas Lights Outdoor projector includes 15 different slides to give you many options when it comes to decorating your home. The following slides are included with this projector: 5 Halloween, 5 Christmas, 1 birthday party, 1 carnival, 1 Valentine’s Day, and 1 Easter. This projector can be left outside your home for nearly the entire year to help you create a festive look on the outside of your house. It’s easy to install and comes with a flat base for sitting on level surfaces or a stake for in-ground installation. This laser projector is ideal for use nearly year-round with the various features and settings. It includes a flat base so you can use the unit indoors for parties if desired. The included remote control allows you to change the timer and other settings from inside your home. The Christmas Projector Laser Lights from Auxiwa have red and green colors. 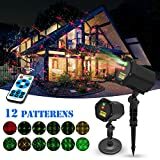 These lights are easy to install and ideal for anyone who doesn’t want to spend time or energy hanging string lights on the outside of their house. This laser light projector is designed to cover a space up to 600 square feet making it useful on small to medium size homes. The lights change color and the shapes automatically change as the unit runs to create a unique effect on the outside of your home. This light projector can show red, green, or red and green lights. They can be set on motion or stationary depending on the look you want. This projector is easy to setup and it includes a 16 foot power cord that can be extended using an extension cord if needed. The 1byone Christmas Outdoor Laser Light Projector has red and green lights that can instantly transform your home or garden area into a festive wonderland. This projector includes a remote control that makes it easy to change the settings without venturing out in the cold. This projector from 1byone is very easy to install. It provides you with a cost effective way to illuminate the outside of your home without needing to climb ladders or use any tools for installation. The unit comes with a stake so you can put it in the ground and have it running within minutes. This laser projector from 1byone uses red and green lights to project flashing or stationary lights onto your home or garden area. The colors can be used alone or together. This unit includes a remote control so you can easily adjust the settings from inside your home. 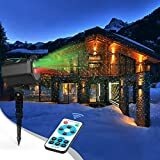 The 2 in 1 Christmas projector lights from GreenClick includes weatherproofing technology so you can use the lights with confidence during any type of weather. This unit also has a impact resistant design which makes it long lasting and durable. 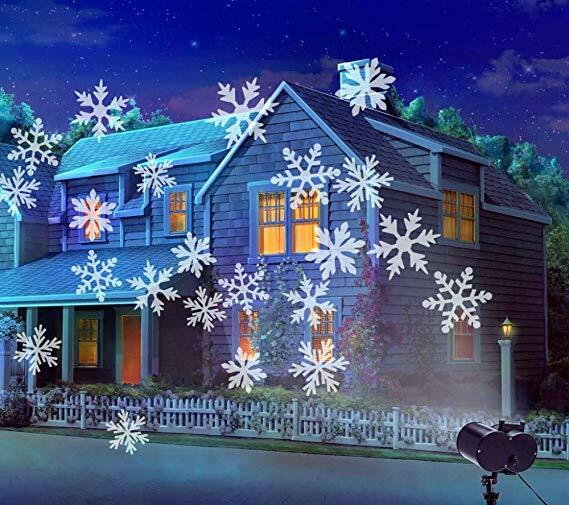 This projector has an upgraded rotating image effect that creates beautiful snowflakes on the outside of your home. This unit can also be used indoors for a party, wedding, or other type of celebration to create a special atmosphere. This laser lights projector is unique in the fact that it shows snowflakes rather than dots like most other projectors. It can be use indoors or outdoors with the included stake or base. The projector is easy to install and can be running within minutes of being removed from the box. The 1byone Aluminum Alloy Outdoor Laser Christmas Lights Projector includes a wireless remote so you can control the settings easily from inside the house. This projector is easy to use. You can simply plug it in and turn in on immediately for beautiful lights around your home. This projector from 1byone has a weather resistant design that prevents damage from being out in the elements. The unit is small enough to be hidden around the landscape in your yard. This unit can be used for Christmas, parties, and other special occasions. This laser projector from 1byone has an aluminum housing that’s designed to last. The unit is weatherproof and can be used in rain or snow. 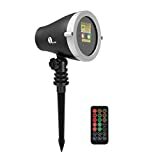 It has red and green lights that can be used together or separately for a beautiful look on your home or garden space. 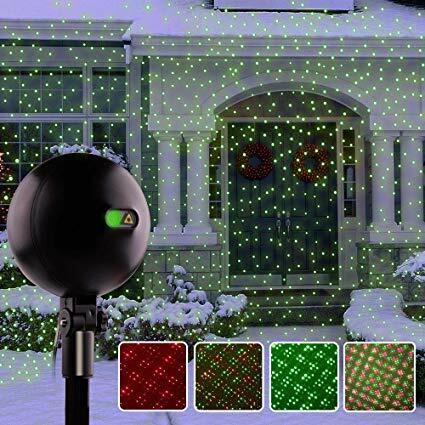 The Innoo Tech Christmas Laser Lights includes a convenient wireless remote that makes it easy to adjust the colors of the lights. This unit also includes a timer function that allows you to adjust the timer using the remote to anywhere from 1 hour to 6 hours to help save energy. This light projector from Innoo Tech has a simple installation process. It has a wide projection distance and can cover a space of around 2500 square feet which makes it ideal for larger homes. It comes with a base and a spike to give you different installation options. This projector from Innoo Tech has 12 different patterns to provide you with plenty of options for decorating your home for the holidays. This projector has red and green lights that can be used alone or together. This unit is waterproof so you can use it in all types of weather. When shopping for laser Christmas lights you should consider the area in which you wish to put them. Some can be used indoors or outdoors which gives you different options for decorating your home for the holiday season. When used indoors these lights can be a fun addition to a party or other celebration. They also work well as outdoor decorations because they can cover a large area with a very simple and quick installation. If you’re choosing lights for outside it’s important to find an option that is weatherproof and designed for outdoor usage. It can be helpful to read online consumer reviews when choosing lights as these reviews can give you objective information on the quality of the lights you’re considering for purchase.